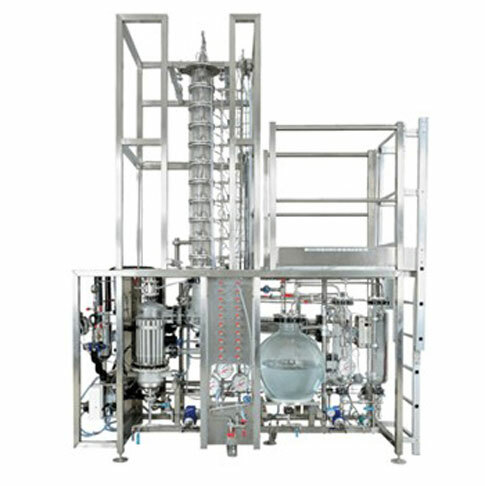 The unit is designed as a pilot scale plant. The column can be fed at several levels through the stainless steel intermediate plates placed along the column. The flow transmitters, the temperature sensors, and the available pressure indicators, allow the user to monitor the process and to study the influences of the different parameters and the operating conditions. The DCS and the software application developed for this unit allow parameter variations, process automation and data acquisition in real time and/or historical. 1 glass tank 100 L.
Thermosiphon re‐boiler made of a glass shell and a stainless steel tube heat exchanger fed by steam. A stainless steel pre‐heat exchanger. Column with stainless steel bubble cap trays. Condenser, glass shell and stainless steel tube. Pneumatic pump and centrifugal pump for feeding and transfer. Scale and stainless steel welded frame.